A PERFECT CIRCLE, who treated a small group of fans and friends to an intimate Grammy Museum performance on Wednesday evening, have released a 2D video for the title track, “Eat The Elephant”, which you can watch on KNAC.COM HERE. The clip, which is taken from the Steven Sebring (Horses: Patti Smith and Her Band, Dream of Life) directed companion film for the album of the same name, is part of a first of its kind, album-length hologram film viewable via a prism included in the Eat The Elephant deluxe box set (https://aperfectcircle.lnk.to/ETEBoxSetPR). A PERFECT CIRCLE’s Grammy Museum performance is a rarity for the multi-platinum outfit whose most recent Los Angeles date was a sold-out evening at the Hollywood Bowl. On Wednesday night, the band offered the lucky 200 fans and friends in attendance an opportunity to hear songs from Eat The Elephant in an intimate setting that highlighted the songs Mojo described as “at once brooding and beautiful.” Billy Howerdel and Maynard James Keenan kicked off the evening by joining the audience for a discussion about the 12-song release. 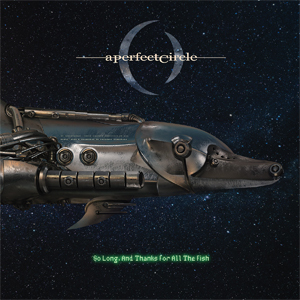 This week, A PERFECT CIRCLE also announced their participation in Record Store Day’s Black Friday festivities, offering a limited edition 7-inch featuring “So Long, And Thanks For All The Fish” with a B-side of the AC/DC cover “Dog Eat Dog”. The “Eat The Elephant” video, Grammy Museum performance and Record Store Day participation kick off what is a busy fall for A PERFECT CIRCLE, who launch a U.S. tour next week and venture back to Europe in December for a three-week trek.